This hearty breakfast has it all – crispy potatoes, soft onions, peppers, eggs, and ham – all made together in one skillet! These easy egg skillet is packed with good ingredients, filling, and simple to make. Make sure to try this smoked sausage hash or ham and potatoes quiche next! 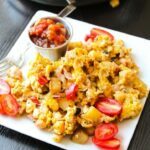 This Country Breakfast Egg Skillet is such a fun and easy breakfast to make… and it has so many delicious flavor packed in! This is what I like to call the “all-in-one” breakfast… it has all the best parts of breakfast in one recipe: eggs, potatoes, ham/bacon, and CHEESE. First, the onions, red bell peppers, and potatoes get cooked until soft on the inside and crispy on the outside, then the ham and eggs get scrambled in, followed by (a large amount of) melty cheese! This breakfast skillet could be eaten as is, or it would be perfect stuffed in tortilla and rolled into a breakfast burrito! The best part about this incredibly flavorful, crisp, cheesy, eggy, ham, flavor packed egg skillet is that it only takes one pan to make. Yup, this diner inspired dish is a one pan recipe you can whip up for brunch– or even dinner. This egg skillet is super flexible, so feel free to add any other toppings you love such as some extra ham/bacon, sour cream, parsley, salsa, etc. I use ham because it has less fat, and I don’t have to spend any time pre-cooking the ham. However, if you don’t mind pre-cooking bacon, it also works great in this dish. If you scramble your eggs, make sure you use a non-stick skillet. Don’t forget to season! Salt and pepper go a long way to making this dish as flavorful as possible. 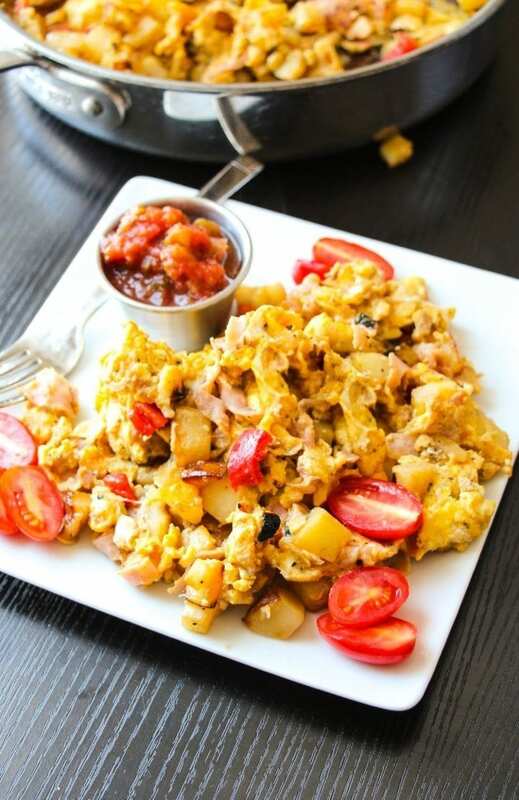 This hearty breakfast has it all - crispy potatoes, soft onions, peppers, eggs, and ham - all made together in one skillet! These easy egg skillet is packed with good ingredients, filling, and simple to make. In a large skillet, cook onion and peppers in butter till tender. Add potatoes and season to taste with the salt and pepper; stir, cover and cook over medium heat for 10 minutes, stir occasionally. Meanwhile, beat together the eggs, milk, Cajun seasoning, ham and 1/2 cup of the cheese. Reduce heat to low and pour egg mixture over potatoes. Cook over low heat, without stirring, until set on the bottom, about 1 minute. Lightly stir and turn eggs to shift uncooked eggs to the bottom and cook gently until eggs are cooked through, but still a little shiny and wet. Don't overcook. Taste, adjust seasonings as needed. Transfer to plates or serving platter, and top with remaining cheese. Serve immediately with a side of fresh, seasonal fruit. Or serve stuffed in tortillas to make breakfast burritos. 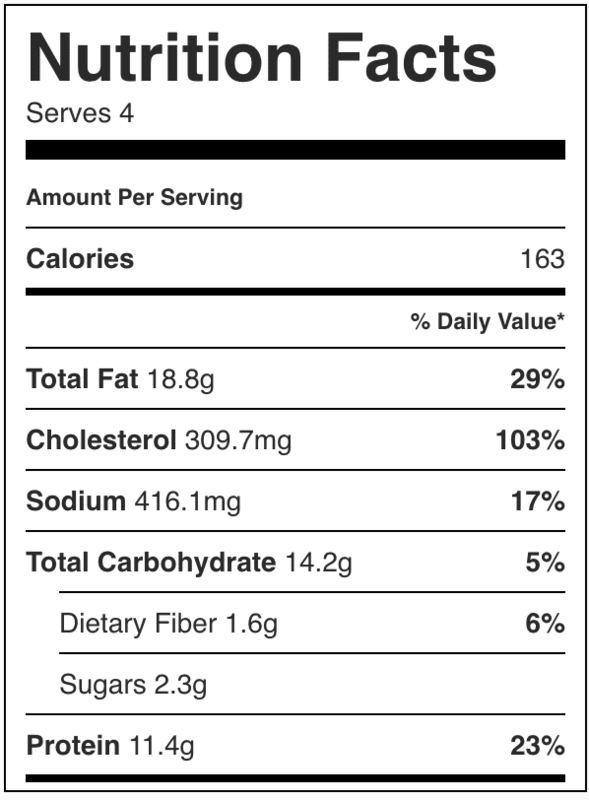 The nutrition facts will vary depending on any extra toppings you add; this nutrition label represents the ingredients in the written recipe. Now this is exactly how I want to wake up every Saturday morning! Butter, cheese, potatoes and ham with a little bit of Cajun kick? You can never go wrong there! Pinned! I just love it. The color is so appetizing! Butter, ham, cheese and potato in one dish. Absolutely lovely! Very tasty!! I will make this again for sure!